Káťa Kabanová is a romantic tribute to Leoš Janáček’s young lover Kamila Stösslová. The Czech composer never failed to portray high emotions in his score writings, and his opera, Káťa Kabanová, is arguably the composer at the height of his music career. Stösslová was only 25-years-old when Janáček (then 73-years-old) had sent hundreds of love letters to her. Interestingly enough, despite dedicating the opera to Stösslová as a token of his affection, Káťa doesn’t have a happy ending. Much to the same fate as Tosca, Cio-Cio san and, even, Tristan, a truly romantic opera, often, ends with the heroine dying, reminding its audience of the powers behind such heartrending and mesmerising music. But, we cannot credit Janáček for everything. Afterall, it the operatic voices of the soloists that evoke the deeper tragedy of Káťa’s literary influences, in this case, a play by Alexander Ostrovsky called The Storm. The open air opera house Opera Holland Park (OHP) has revived its 2009 production of Káťa this week, with the same director and designer Olivia Fuchs and Yannis Thavoris. I never saw the original 2009 staging, but any grievances critics may have had, back then, can set them aside for this second staging, which is worth revisiting. On the night I attended, the City of London Sinfonia performed the orchestral score and, to my ears, it was splendorous and sublime. The vocal parts of the opera were also intensified by a superb cast. We have to thank conductor Sian Edwards for having a good understanding of what Janáček was attempting to achieve, here. The overture was rich and performed to a standard expected by any die hard Janáček fan. The music sections devoted to a romantic setting were soft and sensitive, while the dramatic parts were reassuringly on the radar for Edwards. Seizing the moment, the music was emotionally charged and gripping when required. Set in a Russian town, Káťa is confined from the start. Married to an alcoholic husband Tichon who leaves her behind with his authoritarian mother Kabanicha, she falls in love with a merchant’s nephew Boris. After a romantic tryst, lasting 10 days, she is filled with guilt and shame that she publicly announces her infidelity to the entire community. Saddened by the news that Boris’s uncle is sending him away and realising she is left with nothing but social ruin, she commits suicide and jumps into the River Volga. Thavoris’s staging hints at a wooden path across water, like the River Volga. 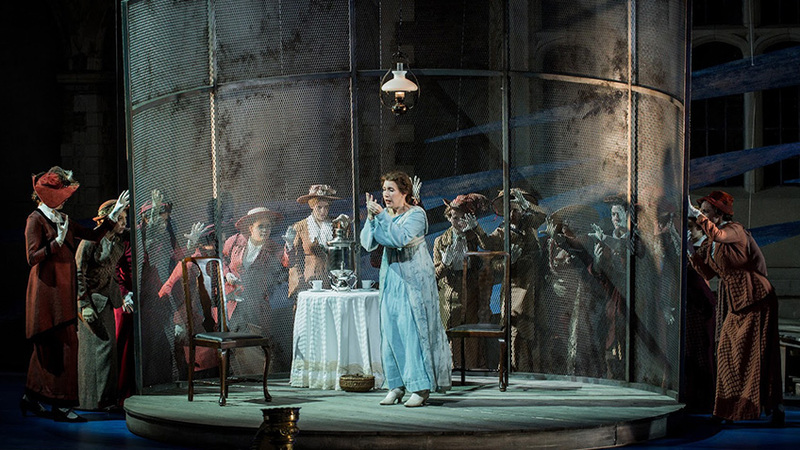 Set on the left is a semi-circular cage, half open, half closed, and from the very beginning, the Chorus singers taunt Káťa with this theatrical prop. Dressed in 1920s costume, as representations of the suburban Russian community, the Chorus singers surround Káťa, performed by Julia Sporsén, who constantly glare at her as if she was a victim of Big Brother’s surveillance. Sporsén gives the audience a thrilling performance. She reveals a woman filled with fear, struggling to survive in a society that scrutinizes women for their public behaviour. Vocally she doesn’t hold back. She sways from gentle and tender tones, with her romantic duet with Boris in Act 2, and moves to fury and distress with a gutsy and excellently sung final act. Peter Hoare gives an applaudable performance, as well, as the sympathetic and innocent lover that gets caught in the midst of Káťa’s love triangle. It is perhaps one of best times I have seen him in a role, as opposed to other ENO productions, where he usually plays a ‘baddie’. Here, audiences get to see what Hoare can really do with a tenor role that requires singing lavish and lyrical lines. Mezzo Clare Presland and tenor Paul Curievici, as Varvara (foster daughter to Káťa’s family) and Kudrjaš, are second to none. They act as the subplot romance as a contrast to Káťa’s impossible relationship with Boris. Presland evokes the cheekiness and liberal side of an adventurous, young girl who can run free and be happy with Kudrjas. Similarly he is also independent and not held down by any obligations. Vocally, they seem to have a good time on stage and make it look easy to sing their parts, even though that probably isn’t the case. Anne Mason, as the evil mother, does her part well. Janáček didn’t write Kabanicha’s music for the audience to like her. In fact, Mason doesn’t make it difficult for the audience to dislike her. In the same light, Janáček didn’t write beautiful parts for Kabanicha (obviously), which unsurprisingly makes Mason seem cold and, in some parts, bland. Yet, this shouldn’t discredit Mason’s overall stage performance as she presented a major influence of the overall tragedy of the opera. On the other hand, Nicky Spence’s depiction of Tichon was rather mixed. Seeing it from Spence’s perspective, there are difficulties with performing the role of Tichon: a twisted husband who is easily persuaded by drink and a demanding mother, who later realises, when it is too late, how abusive and neglectful he was to his vulnerable wife. I cannot question Spence’s vocal skill here as I have seen and heard him in other roles with more poetic lines, yet, sadly, this isn’t one of them. Nevertheless, I was touched when he was on his knees mourning the death of Káťa in the final act, with Sporsén, playing dead, in his arms. If I had to complain about anything, however, it would have to be the volume. It would have been nice if the music was a touch louder, but this simply wasn’t possible. Being ‘open air’ means being subject to other audible distractions and the possibility of sound and music going elsewhere. This is just one of the, few, things we have to accept with OHP performances. Janáček’s opera lasts no more than 2 hours and is performed sparingly in the UK. If there is an opportunity to see any of Janáček’s operas, one should always try to make it their mission to see it. OHP’s production of Káťa is a perfect example of this. Mary Grace Nguyen was born and raised in London’s Notting Hill. Mary Grace Nguyen was born and raised in London’s Notting Hill. She has a Master's in Journalism from Birkbeck College , University of London, and she graduated at UCL in Anthropology, studied Modern Japanese at the School of Oriental and African Studies (SOAS) and taught English in Japan. She worked as a headhunter in the finance market before pursuing a career in journalism and corporate copy writing. She reviews theatre, opera, art and film for LNDCARD, LondonTheatre1 and her own blog TrendFem. She is also co-founder of Birkbeck's online student magazine Flock To The Crown BBK. She also enjoys writing poetry, short stories and opinion pieces.